4-location of figures 7 and 8 at 42º 41' N. 5-location of figure 9 at 42º 45' N. Data: 1/3 arc second NED (Courtesy of USGS). 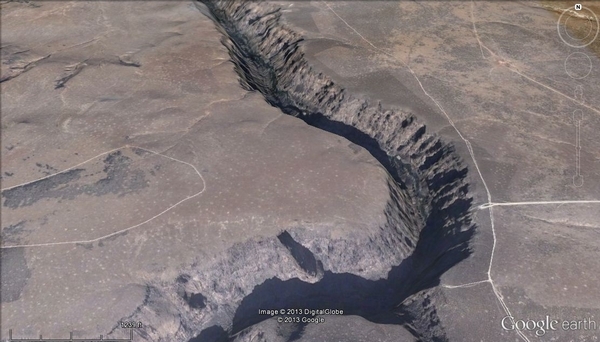 Google Earth image © Google. Google and the Google logo are registered trademarks of Google Inc., used with permission. Same location than in figure 7. View to the northwest. 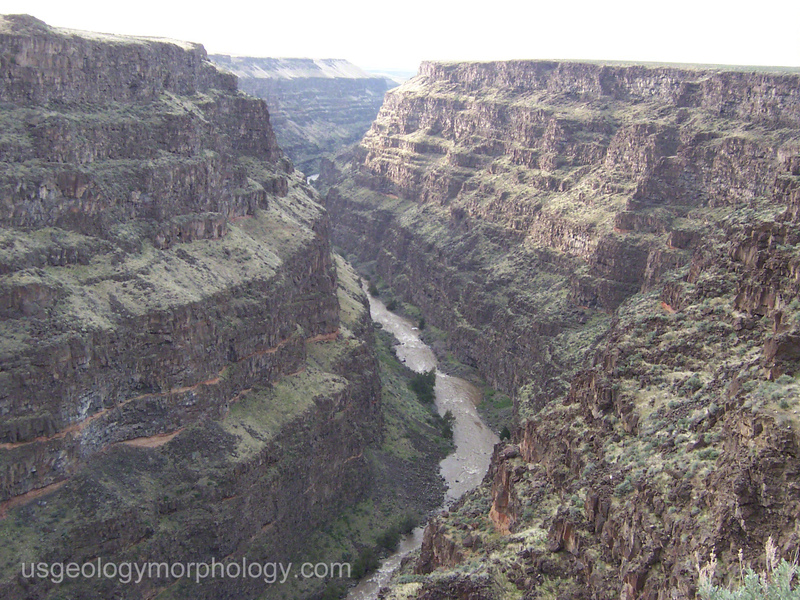 Units in or near Bruneau Canyon. Quaternary: Qls-Landslide deposits. Quaternary or Tertiary: QTgq-Gravel surface, abundant quartzite; QTqb-Gravel surface, abundant quartzite, significant basalt. Tertiary: Tgq-Gravel lens or surface, abundant quartzite. Miocene to Pliocene: Ti-Clay- to sand-sized sediments; Thot-Reefal limestone of Hot Spring. 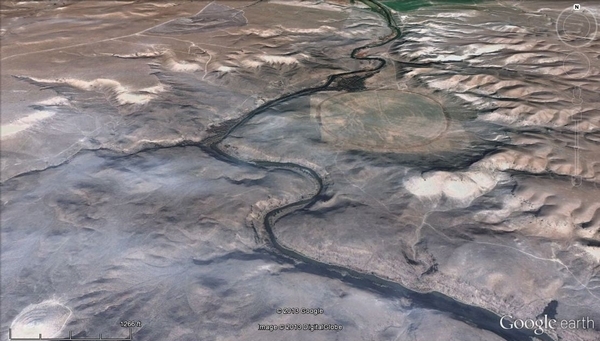 Pliocene: Twc-Basalt of Winter Camp Butte; Tcuf-Basalt of Curlew Flat;Thc-Basalt of Hot Creek; Tind-Basalt of Indian Bathtub; Tbuc-Basalt of Buckaroo Dam; Tharu-Upper basalt of Harris Dam; Tharl-Lower basalt of Harris Dam; Tcro-Basalt of Crowbar Gulch; Tbru-Upper basalt of Bruneau River; Tbrm-Middle basalt of Bruneau River; Tbrl-Lower basalt of Bruneau River; Tmw-Basalt of Miller Water. Adapted from Jenks (1998). 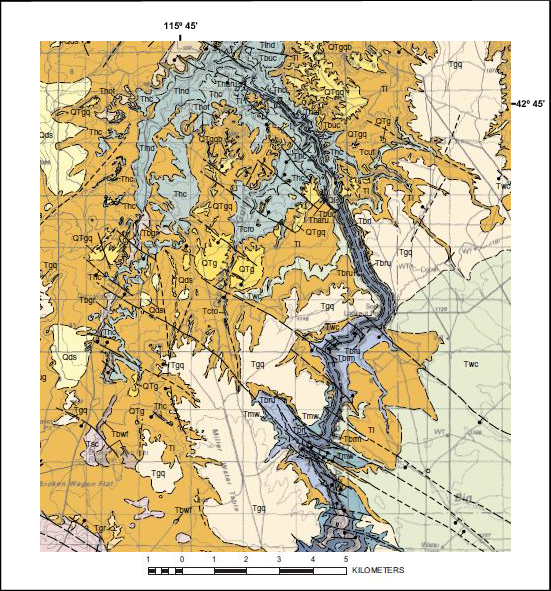 Jenks, M.D., Bonnichsen, B., and Godchaux, M.M., 1993, Geologic maps of the Grand View-Bruneau area, Owyhee County, Idaho: Idaho Geological Survey Technical Report 93-2, 21 p., 19 maps, scale 1:24,000. 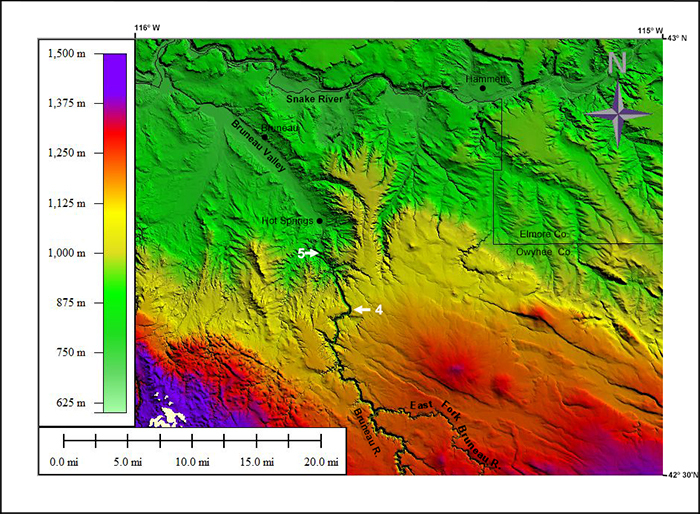 Jenks, M.D., Bonnichsen, B., and Godchaux, M.M., 1998, Geologic map of the Grand View-Bruneau area, Owyhee County, Idaho, Digitally Compiled Version, scale 1:100,000.